Is gold in the hand worth more than money in the bank and a good reason to buy gold? 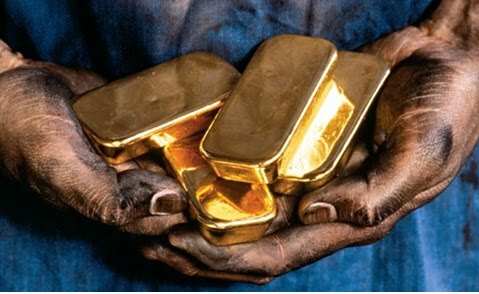 In November last year Robert Zoellick made the suggestion that the world economy could do with good old fashioned gold to stabilise the worlds economy. Was this just a yelp of pain or was it a comment on the soundness of using gold as a basis for the world economy? Or was it a dawning realisation that perhaps John Maynard Keynes, considered one of the greatest economists of our time and who described gold as a "barbarous relic" may not have been right after all. While the world rocks with massive financial debt and instability, gold continues to defiantly climb in value; a whopping 30 percent in 2010, and showing no sign of stopping. Historically, every currency in the world has fallen against gold. Gold, as a currency, cannot be expanded or 'printed' at will. It cannot be made more than it is, you cannot stretch it, squeeze it, make it longer or thinner. You cannot cut it up and have it reproduce itself. One can try to 'short' gold of course on the market, but in short (pun intended) it cannot really be manipulated. Printing money is like pebbles from the beach. One simply goes down to the beach and collects more pebbles if one has too much debt. Then use those pebbles to pay off the debt. As there is a virtual unlimited supply of 'pebbles' the value of each pebble decreases just that bit more as more and more pebbles are collected. Consequently where 20 years ago one ounce of gold was worth about 400 dollars, today it is in the range of 1400 dollars. Now 1400 dollars buys the same as 400 dollars purchased twenty years ago. The ounce of gold has not changed. To buy gold you now need 1400 'pebbles' But the value of the currency has deteriorated so much that one needs an extra 1000 'pebbles' from the beach to buy the same value of goods. You need a lot more 'pebbles' to buy gold these days. Over the past decade stocks have fallen 24 percent while gold has risen 280 percent. A sad commentary on the ability to manipulate the financial market by the printing of money, but a boom for those with the foresight to invest in cold hard solid gold. Even in the 2002 to 2007 stock market boom time, gold was still beating stocks and that was before the GFC and financial bubble burst. So what is the real value of gold? All the gold in the world is estimated to be worth (at today’s prices) around 6.5 trillion US dollars. But only five percent of that is traded around the world, around 320 billion. The mining industry produces about 2500 metric tons of gold each year, about 80 billion dollars worth and half of that is used in the jewelery and industrial sectors. Less than 40 billion is available, then, to the global investment market. From this it can be seen that a substantial shift of funds into gold would cause a sharp rise. Even now with the price in the 1400 range a simple 6 percent rise will bring it to 1500 easily. A 30 percent increase this year will easily bring gold to over 1800 dollars an ounce. With more institutions and pension funds looking to protect their portfolios, increases in their gold holdings are at the top of the list in an effort to offset the potential problems of heavy investment in a shaky economy. Shayne McGuire, professional fund manager of the $500 million GBI Gold Fund for Teacher Retirement System of Texas, states in his latest book, Hard Money: Taking Gold to a Higher Investment Level, that "10,000 dollars per ounce is not out of the question". Indeed, given the massive debt the current economic system has been producing, one can ask oneself, what price is gold in the hand really worth in today's economic climate? if you want to retain your value, it is a prudent idea these days to buy gold. After all, how much are pebbles really worth?